Presentations can use a dedicated app. Sometimes they involve multiple apps and demo segments (which requires being able to show any window on the presentation display). Presentations can be slides, photos, video. Presentations typically happen on a single display, but there are cases where there might be more than one. Some presentation software has a presenter display which is different from what is shown to the audience. You can have a single presenter display and multiple presentation displays. 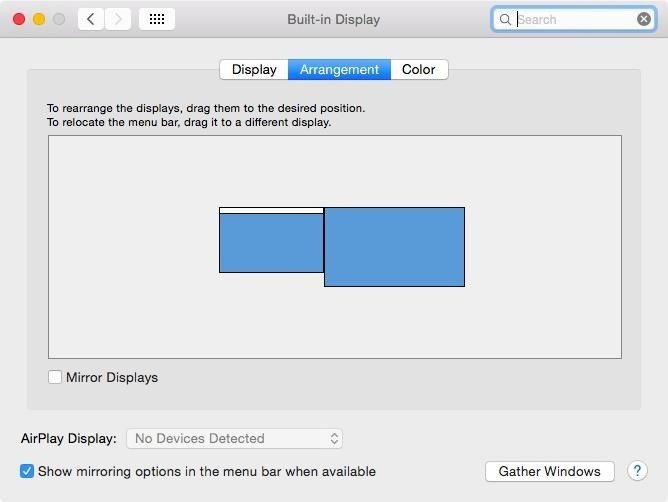 Three displays or more are less common but do happen. these can be presentation setups but are more likely to be multi-display workspaces. It is difficult to put an upper limit on the number of displays we need to support. Some hardware might not be capable of outputting to a display at its natural resolution. in this case we "mirror" the displays, scaling up the output from the primary display to the secondary. The settings panel needs to communicate this state. 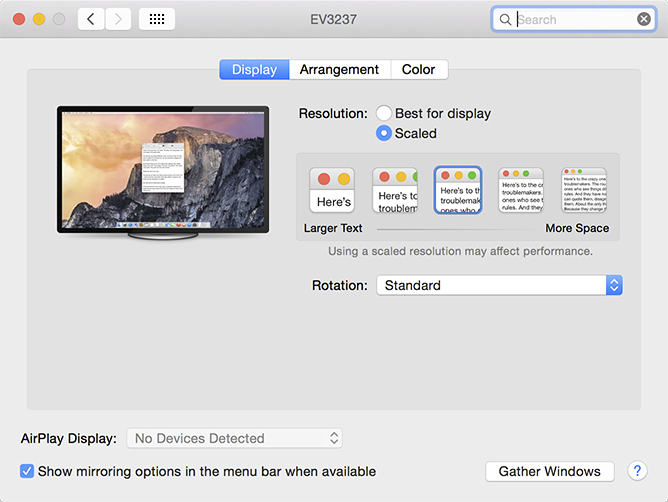 One of the main challenges with the display settings is how to support the common cases well, while also supporting all the poorly defined edge-cases, and not have a complexity explosion in the process. This would avoid the user's pointer from accidentally ending up on the presentation display (which might well be behind the user). It would also avoid showing personalised wallpapers to the world. Presentation mode will not really work for demos, since you cannot have the pointer on the display. We probably also need to recognise that there can be multiple presentation displays. SeanMiddleditch: the displays should be very clearly numbered. Far more people in office situations have two identical displays than have a laptop and a monitor (at least in the service business and in the games business), and using the name is pretty worthless when you've got two or three monitors that are all 'Viewsonic 21.5" 1920x1080'. 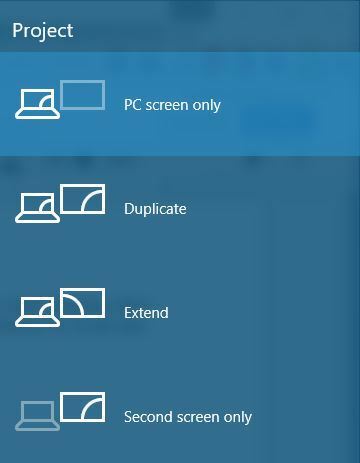 Hate to say it, but look at how Win7 handles this: each display is just a number, and the Identify feature slaps the number in full-screen glory onto each monitor. Makes it significantly easier to identify displays than names or colors. If we implement this, we should keep wayland in mind, as that changes radically the way multi-monitor is handled, giving the compositor access to the low level details. In particular, see Wayland/Gaps/DisplayConfig for the proposed protocol to aid in this transition. Mutter will then take care of only showing "presentation" windows on that screen. Turn off: assign no CRTC. Also applications need to be notified that a screen is presentation, and the compositor needs to know that a surface is really a presentation. It's easy to do it under X (a property on the root window with the Xinerama indices of presentation screens, and a property on the client window), but for wayland we need to invent a new protocol, extending wl_output and wl_shell_surface. Therefore, if presentation mode is really wanted, it's best to contact the wayland upstream developers and have the feature integrated there. What would be the application API for this? A property on GdkWindow? Should apps be able to decide for themselves on which output they want their presentation, or should it handled by the toolkit/compositor? Should Gdk report presentation screens as regular screens, for example in gdk_screen_get_n_monitors() and gdk_screen_get_monitor_geometry()? 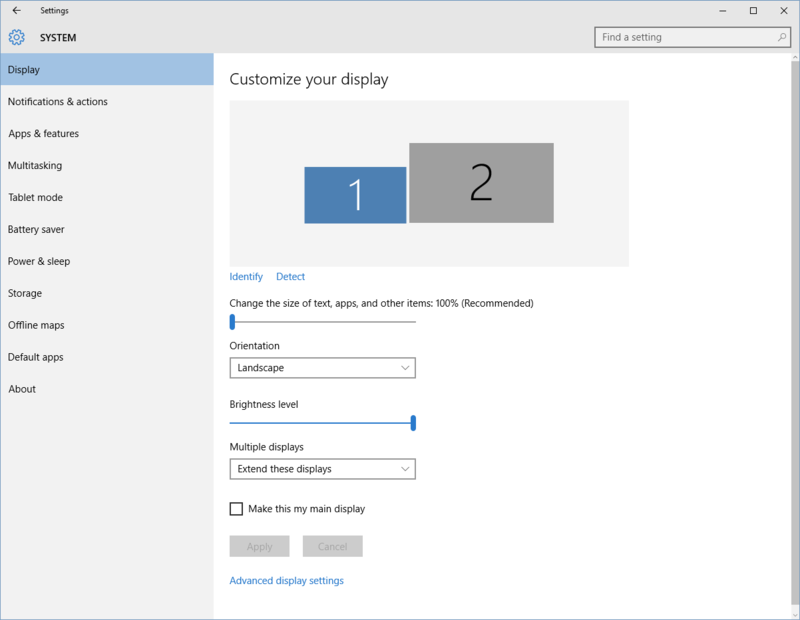 What if legacy (not presentation screen aware) applications request to be shown on the presentation screen? Should the compositor move them away gently or just disable rendering them completely? What if the legacy app is fullscreen?